Adventure, danger, and a thrilling global mission await 12-year-old Cruz Coronado as he joins an elite school for explorers. TRUDI TRUEIT has written more than 100 books for young readers, both fiction and nonfiction. Her love of writing began in fourth grade when she wrote, directed, and starred in her first play. She went on to be a TV news reporter and weather forecaster, but she knew her calling was in writing. Trueit is a gifted storyteller for middle-grade audiences, and her fiction novels include The Sister Solution, Stealing Popular, and the Secrets of a Lab Rat series. Her expertise in kids nonfiction encompasses books on history, weather, wildlife, and Earth science. Born and raised in the Pacific Northwest, Trudi lives in Everett, Washington. SCOTT PLUMBE is an award-winning illustrator, designer and fine artist whose work appears in books and magazines, games, interpretive centres, private collections, and more. His illustrations have been featured in magazines such as Communication Arts (US), Applied Arts (CA), Creative Review (UK) and 3x3 (US). "A fun, exciting, and action-packed ride that kids will love." —J.J. 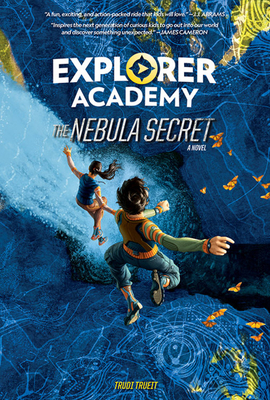 Abrams, director and screenwriter of "Star Wars: The Force Awakens," "Lost," "Alias"
"Explorer Academy is sure to awaken readers' inner adventurer and curiosity about the world around them. But you don't have to take my word for it, check out Cruz, Emmett, Sailor, and Lani's adventures for yourself!" —LeVar Burton, host of "Reading Rainbow" and "LeVar Burton Reads"